Joanna C. Valente is a ghost who lives in Brooklyn, New York. Joanna is the author of Sirs & Madams (Aldrich Press, 2014), The Gods Are Dead (Deadly Chaps Press, 2015) Marys of the Sea (2016, ELJ Publications), and Xenos (2016, Agape Editions). Joanna received an MFA in writing at Sarah Lawrence College, and in 2011, and was the recipient of the American Academy of Poet’s Prize. Joanna is also the Founder & Chief Editor of the magazine, Yes, Poetry, as well as the Managing Editor for Luna Luna Magazine and Civil Coping Mechanisms. 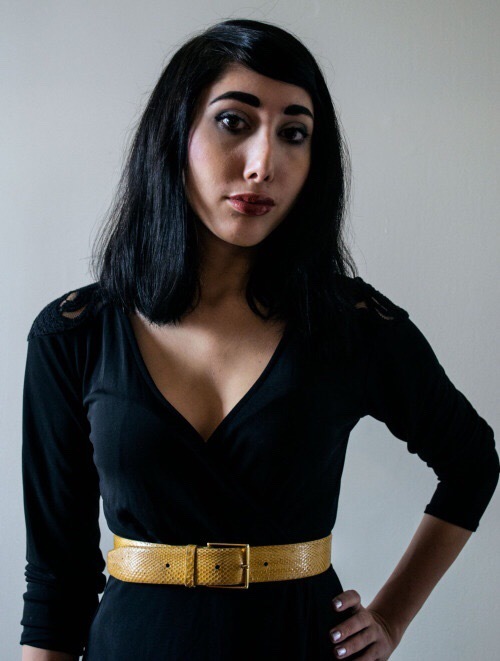 Some of Joanna’s work has appeared in Prelude, BUST, Brooklyn Poets, Columbia Journal, The Huffington Post, Tarpaulin Sky, The Feminist Wire, The Destroyer, The Atlas Review, among others. Joanna completed undergraduate degrees at SUNY Purchase College in creative writing & literature, and currently teaches courses at Brooklyn Poets. I’m often interested in how writers get started writing in the form or genre that they love. What got you started with writing poetry? I was 11 years old and my mom got me Emily Dickinson’s collected works. I read it cover to cover and decided I wanted to do what she did. I was already a pretty artistic kid, since I painted and sketched, so it also felt like a natural curiosity to explore my creativity with writing, especially since I was becoming more self-aware. I still do both, and while painting/drawing has taken a bit of a backseat to writing, I also believe these things come in waves, and we work in the medium that speaks to us best in that moment. You juggle a lot of editorial hats, between Yes, Poetry, Luna Luna Magazine, and Civil Coping Mechanisms. How do you manage between three very different editorial perspectives? How has juggling all of these editorial hats affected you as a writer? I actually love being busy all of the time, I don’t know how to sit still (probably the New Yorker in me). Editing feeds me creatively, and allows me to keep thinking critically, even when I’m not writing. I love the diversity of the work – and the autonomy I have with each site. As a result, my own aesthetic and interests have grown because I’m deeply invested in all sorts of writing (like the occult, surreal/bizarre writing, political writing, etc). I also think it’s made me a faster writer, because I not only know what I want more, but being busy makes you schedule your time better, and utilize whatever time you have to the best of your ability. Which is why I do write so often, only because I feel passionately about it. I notice in some of your work that you play with the shape of poems, with pieces like “Twin Lovers”, “Their Hell”, “Bringing Home the Bacon”, and “The Fool Forgets Who He Is”. How or when you decide the shape of a poem? How do those shapes influence the reading of them? Because I am also a visual artist, I do think visually – and arrange my poems in the way I see them in my brain, as I often see scenes like a film, as opposed to just imagining words. I also want the shape to reflect the sonic quality of it as well, so besides the visual representation (which I use to take advantage of and mold the negative space on the page) but it will help the reader with pausing and where to read the lines breaks. What is a poem you’ve written that makes you cringe when you read it? Do you read your earlier work to see how far you’ve come as a writer? Bonus points if you’re willing to share said poem. All of them. I mean, it’s hard not to be self-critical even with my new work. In terms of old poetry, oh, it’s so hard to say. I’m sure there’s a bunch, but I really don’t really a lot of my older work just because. And I’m proud of everything I’ve gotten published, even if I have grown from it (and I hope I have, isn’t that that the point?). Don’t be afraid to. I know it feels gross and arrogant to share your work on social media often, but you have to do it, because who else will? Share on your social media, engage with other writers and promote them too. That’s the thing, we don’t have to feel gross about championing ourselves if we champion others too. It engages you with your community, makes you think differently, and also makes you appreciate those around you. What other genres of writing are you working in, if any? Fiction and nonfiction. I try to be diverse. Right now, I’m working on a novel. I also publish nonfiction essays (like in BUST, Luna Luna, etc). Have you ever completed in a poetry slam? If not, would you consider doing it? I have not. I’m actually very shy, despite that I do read my work often, but there is something about slam that makes me nervous, especially since I don’t memorize my work. I know not every slam poet does, but it’s definitely usually part of the course. How has the geography of New York influenced your writing? How has it not? I think that’s the better question. It’s everywhere in my writing because it’s in me.